Dates, sometimes called palm fruit or date palms, are native to dry, arid climates such as the desert. The fruit of the palm tree, dates can be eaten fresh but are more commonly dried and eaten as is, or they can be used to make smoothies or stews to which they add a rich sweetness. Dates are high in fiber and calories, and consuming too many can lead to weight gain or digestive trouble. According to the U.S. Department of Agriculture, a serving of two Medjool dates has 140 calories, which is high given the small serving size. If you regularly eat dates as part of your diet — either as a snack or as an ingredient in a dish — be mindful of the extra calories they add. A pound of body weight equals 3,500 calories. 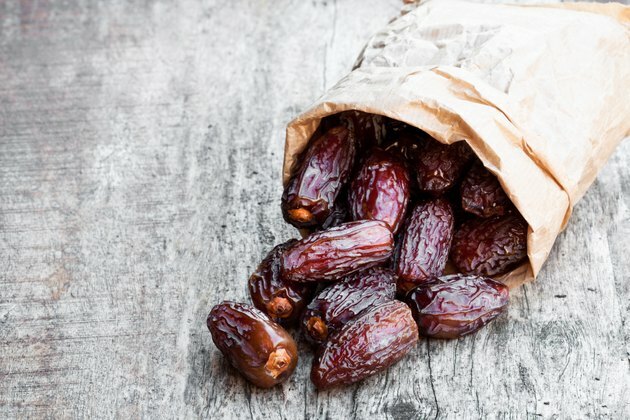 Regularly consuming dates can lead to a caloric buildup, which can in turn cause weight gain, so consider the potential drawbacks and benefits of dates when you're adding them to your diet. Read more: What Are the Benefits of Eating Dates? Fiber is an important part of a balanced diet, helping to prevent constipation. Consuming fiber also helps make you feel full faster, which is helpful when you're trying to lose weight. However, too much fiber can lead to unwanted side effects. Dates are naturally high in fiber, and a 1/4-cup serving has 2.7 grams of fiber. The University of Maryland Medical Center recommends 20 to 35 grams of fiber per day; men need more fiber than women, which means a serving of dates will give you 7 to 13 percent of the recommended dietary intake. Because most Americans consume roughly half of the recommended intake of fiber, a sudden increase can cause digestive issues, including excess gas, constipation, abdominal cramping and bloating. Dates are naturally sweet, with almost 30 grams of sugar per serving. The natural sweetness of dates comes, in part, from its fructose content. Fructose is a natural sugar found in fruits and a few vegetables, and some people have difficulty digesting it. Also known as fructose intolerance, poor fructose absorption leads to the sugar passing through your digestive system whole because your body is not able to break it down. When it reaches your intestines, it can cause diarrhea and gas as well as abdominal pain because it reacts with the natural bacteria in your gut. Because of their high sugar content, dates are considered a high glycemic food. The glycemic index or GI is a measurement of how quickly a food affects your blood glucose levels. According to University Health News, dates have a GI score of 103, while glucose is measured at 100. They also have a high glycemic load, which is a measurement of how much the carbohydrate content of a food affects blood sugar levels. Because dates are high in carbohydrates, with around 40 grams per 2-ounce serving, they have a high glycemic load, measuring 42. Overconsumption of foods with a high glycemic index and load can increase your chances of Type 2 diabetes, heart disease and obesity.